This page is meant to take you through your first two days (40 real world minutes) of Minecraft play. It takes you step by step though how to make tools, build shelter, and secure food. Don't be discouraged if you're not able to accomplish all these tasks in the first two days; as long as you are able to build some kind of shelter, you can learn everything else at your own pace. Your avatar is controlled using the w, a, s, d, and space bar on your keyboard. 'W' moves you forward, 'A' to the left 'D' to the right, 'S' backwards and space bar makes you jump. The position where the game starts you is called your spawn point. To 'harvest' a brick, point at it with your mouse and hold down the left button. You will see the block start to look like it is breaking up. Breaking a block with your hand takes several seconds, just keep holding the left button down continuously. Dirt is the easiest to break, then wood, then stone. Once a block has broken it will appear on the ground as a miniature of what it looked like whole. Running over the tiny block will pull the block into your inventory. You can not break blocks that are too close to your spawn point, so move thirty or so blocks before trying to harvest a block. This picture shows the image after hitting 'E' to see your inventory. The crafting table is on the top, when a block of wood is placed in the inventory, it is converted to wooden planks. The full personal inventory is under that, and the nine items that are available during game play are in the separate set of boxes on the bottom. The first thing you should do is find a tree and break it down to get wood blocks. From wood you can craft your first tools, which greatly speeds up harvesting materials in the world. There are several distinct biomes in Minecraft that you might have spawned into, so the number and type of tree will vary. If you have spawned in an area without trees, and you can't see any trees, just pick a direction and run in it. The biomes are typically small, within a few minutes of running you should find some trees. Hold the left button down on the trunk of a tree to break the block. Depending on the size of the tree you can get 5-10 wood blocks from each tree, harvesting ten blocks should be enough to get you started. Once you have a few wooden blocks, you are ready to start crafting. By hitting the 'E' key to see your inventory, you'll also see there is a small four block crafting table, just above your inventory items. By clicking on your wood blocks and moving them into any of the four blocks on the left of the crafting module you will see that the output on the right shows wooden planks. Clicking on the wooden planks will allow you to move them from the crafting table and place them in your inventory for use. You will also see that you get 4 wooden planks per wood block. 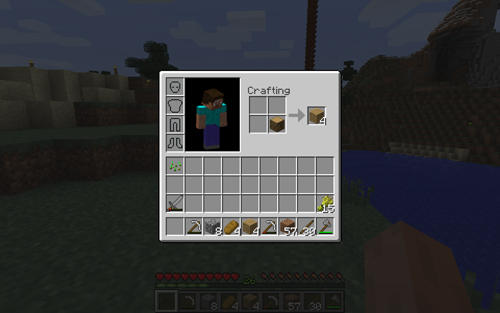 Putting a single wooden plank into each of the four positions will make you a crafting table. Move the crafting table into one of the nine spots on the bottom of your inventory, and hit 'E' to get out of the inventory screen. Select the crafting table, and then right click anywhere on the ground, and that will place the crafting table on the ground in the world. Now you are ready to make tools. The first tools you will want are pickaxes, shovels and axes. Harvesting blocks can be done with any tool, but if you use the 'right' tool it goes much faster. Shovels harvest dirt and sand, pickaxes harvest cobblestone and all the ores, and axes harvest wood. To make tools you will first need to turn some of your planks into sticks by placing one wooden plank in a position directly above a second wooden plank. This will form sticks in the output on the right. To use a tool simply select it in your set of 9 items. The tool will appear in your hand in the game. Now holding the left mouse button on an item will cause it to break much faster. Once you have wooden tools, you will want to start upgrading them to cobblestone. Cobblestone tools last longer, and harvest materials faster than wooden tools. To harvest cobblestone, use a wooden pick axe. If you are in an area without cobblestone on the surface, use a wooden shovel to remove the first few layers of dirt and cobblestone will be underneath it. Harvest 10-12 cobblestone blocks. Once you have cobblestone blocks you are ready to make cobblestone tools. The recipes are the same, except that instead of wooden planks you will use cobblestone blocks. Make a shelter for the night Once you have stone tools, the next order of business is to build yourself some kind of shelter. There are bad guys that spawn at night and will try to kill you- skeletons shoot arrows, zombies and spiders attack with their hands if they get close to you, and creepers are green little creatures that move up behind you and then blow up. The good news is that building a wall two items high will keep all the bad guys out and allow you to spend the night in safety. Harvest extra dirt or cobblestone and build yourself a small castle at least two items high. Alternatively, you can dig yourself a cave out of the side of a mountain and then close in the outside wall, or dig directly into the ground and close up the roof. Getting to this point will allow you to make some more tools and get ready to mine. If you aren't able to make a shelter and you get killed once night falls, the game will respawn you at your initial spawn point. If you are then able to get bak to where you died within five minutes, most of your items will still be laying on the ground and you can just run over them to pick them back up. Now that you have a shelter of some kind built, you will need to make some lights. Bad guys can't spawn in the light, and having some light will let you keep working through the night. Coal and Charcoal Coal is fairly common in the world. In some biomes, you will see coal just sitting on the surface, especially on stone mountains. Breaking a block of coal ore will yield a chunk of coal, which can then be crafted into torches by placing it on a crafting table directly above a wooden stick. Torches are then placed in the world by right clicking where you want them. They can be placed on the ground, on walls, or even on living trees. If there is not coal readily available, the next best thing is charcoal. To produce charcoal, you first need an furnace. Once a furnace is crafted, place it by selecting it and right clicking anywhere on the ground. Right clicking on the furnace then shows you two input slots, one above and one below, and one output slot on the right. Placing wooden blocks in the bottom spot as fuel, and in the top spot as the item to be burned, produces charcoal in the right output slot. Only wood blocks work, wood planks do do. The charcoal can then be crafted into torches the same way as coal, by placing them on a crafting table directly above sticks. Once you have light and a few cobblestone pick axes, you are ready to go mining. Finding Iron, Gold, Diamond, and Polycraft Ores The type of mine to build is entirely up to you, but the simplest one is to start digging down starting inside your shelter and digging steps as you go down, placing torches on the walls as you need them. Different ores spawn at different depths in the world. Close to the surface you will find mostly cobblestone, coal, and iron. Iron is very important, as it can be smelted into iron ingots and crafted into iron tools, which are again longer lasting and faster than stone tools. As you move down you will start to see Polycraft ores and red stone. Polycraft ores can be broken by a cobblestone pick axe, but red stone can not. Once you get within 15 or so levels from bedrock you will start to find gold and diamonds. The first night, focus on finding iron and coal, and expanding your mine. Building a bed to avoid the night monsters. Congratulations, you've made it through the night! By the time the sun comes up on your second Minecraft day, you will likely be getting hungry. Your hunger status is shown on the right side of your screen as a series of ten drumsticks. As you get hungry the drumsticks start disappearing. Once your so hungry that all the drumsticks are gone, your health, shown on the left as ten hearts, will start to decrease. It's time to start finding some food. Food in the world comes in the form of both animals and plants. Cows, chickens, and pigs spawn randomly in the world. They are killed by holding down the left click button on them, just like breaking other blocks, and after a few seconds meat will drop. Meat then needs to be cooked in your furnace. This is the fastest way to get food. To eat food, select it from your bottom row of 9 items, and hold down the right mouse button. You should see the food come to your 'mouth' and start disappearing. If nothing happens, just find some free space or if you are outside look directly up and then try eating again. Alternatively, if you break the grass by left clicking on it, some of the grass will randomly drop wheat seeds. Wheat seeds can then be planted and will grow over 5-10 minutes into wheat plants that can then be harvested to get wheat. Wheat can then be crafted into bread and eaten. This is a good process to get started early on, as it will take a day to get to mature wheat. The night cycles can be skipped by crafting and sleeping in a bed. 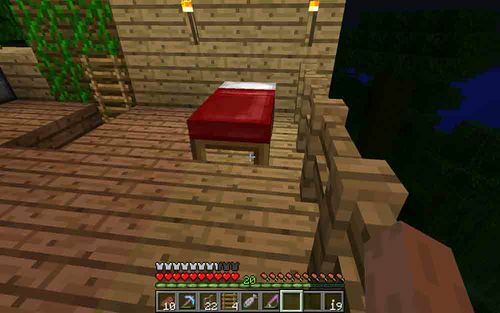 Sleeping in a bed also re-sets your spawn point, so if you die after sleeping in a bed you will respawn to your bed. Crafting a bed requires wool and wooden planks. Wool comes from sheep which spawn pretty frequently in the world. It can be obtained by killing the sheep, or later in the game once you have iron you can create sheers which will sheer the wool without killing the sheep. You now have all the skills you need to survive and explore in the game. There's a lot left to learn, explore, and build. Once you're comfortable with these basics, I suggest creating a tree tap to start getting some PolyIsoPrene so you can start into the world of polymer objects. Then you can try making a pogo stick, or placing PolyIsoPrene blocks to bounce on. You can even make grips to make your tools even faster and longer lasting. Have fun! This page was last modified on 29 August 2018, at 22:38. This page has been accessed 24,998 times.